And the wins just keep on coming for the Lady Bulldog golfers. 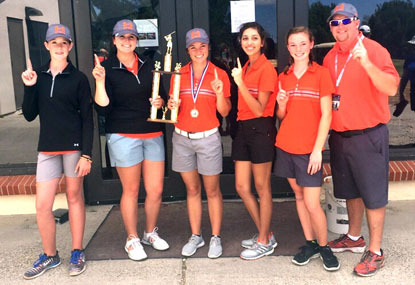 The Artesia girls notched another significant tournament victory Monday and Tuesday at the heavily loaded Spring Classic in Roswell, shooting a team 350 on Day One at Spring River and following up with a 342 Tuesday at NMMI to best their closest competition – Class 6A Clovis – by 19 shots. 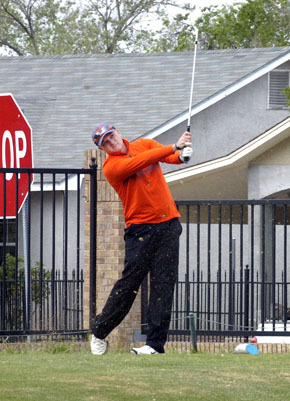 The Bulldogs, meanwhile, had a solid two days, as well, against the large field, coming in eighth with team rounds of 319 at NMMI and 328 at Spring River. The tourney also included Socorro, Hobbs, St. Michael’s, Hope Christian, NMMI, Carlsbad, Silver City, Portales, Ruidoso, Deming, Alamogordo, Lovington, Goddard and Texico competing as teams. The Lady Bulldogs were equally solid individually throughout the two-day event. Sophomore Josey Jackson took second place overall in the tournament with rounds of 82 and 76, and Brehnan Davis, Taysea Powell and Teagan Archer joined her in notching state legs at Spring River Monday with respective rounds of 85, 90 and 93. On Tuesday came an even more impressive feat: All five of the Lady ‘Dogs logged qualifying scores, with Davis delivering an 80, Archer a 92, and Powell and Sydni Salmon 94s. The Bulldogs were led on the tournament by Chaz Matthews and Jake Craft, who tied for 16th overall with two-day totals of 157. Matthews posted an 80 at NMMI and Craft a 75, and the two turned in rounds of 77 and 82 respectively Tuesday at Spring River. Giovanni Huitron logged a 164 for the Artesia boys on the tournament with rounds of 80 and 84, Parker Sanders a 173 (84 and 89), and Wesley Davis a 183 (98 and 85). “I felt this tournament was a good test for us,” said Bulldog coach Paul Kirkwood, “especially playing at Spring River the second day. It is a course where you have to keep the ball in the fairway, similar to Pinon Hills, where state will be played. The Bulldogs and Lady Bulldogs will have another busy week ahead of them next week, as they had to the Rockwind Community Links in Hobbs Tuesday, the Lovington Country Club Wednesday, and back to NMMI for the annual Last Chance Open Thursday. “We haven’t peaked yet,” Bean said of the Lady ‘Dogs. “But we’re right there. We need to putt better. We’re hitting the fairways, we’re hitting the greens, but we’re taking a lot of strokes on the greens, and if we get that number down, we’ll be in great shape.